I had my Social Security Disability Insurance (SSDI) Physical Eval today. Here I am, wide awake at 2:30 in the night. How I wish and hope for sleep. Hot flashes with profuse sweating seemed on the menu this evening and now. That is what woke me. In addition to my back hurting. And my neck hurting, and a lot on my mind. My SSDI Physical Examination went ok….I guess. I cried. Through almost the entire interview. I was hurting and I am tired of explaining what my hard days are like over and over. I try to focus on my good days or the things I CAN do. Having to rehash what it feels like when I am hurting really bad, or look at and talk about and explain about the many things I can’t do or how I have to do them different. It’s not like that EVERY day…but enough days that I can’t make promises for a consistent output of production of anything. And talking about the things I’ve lost, the nursing career I had dreamed of and worked so hard for, the working my way up in life, the expanded choices in my life because of steady income. I pray that the determination is in my favor. It requires so much energy and emotional output to go through the process…it takes a toll. So, as I told this doctor who was a stranger to me before today and that likely I won’t see again,” I hope I get granted my disability so I can get some medical help and try something new so that maybe, someday, I still will use my skills and education that I worked so hard for. I still have hope for that you know?”. Thank you to those that said a prayer for me. For now, I am going to just let go of all of the battle for disability until I hear the answer. It’s best to not dwell on it. God will continue to provide and I will just keep taking the days One at a Time. REnew, REuse, Recycle…the birth of a new coop for our girls! Sweetie peeking through the fence, wondering “what’s out there?”. I have moved into an abandoned hoarders’ house. My boyfriend moved here first. I will post about some of the transformation we have accomplished later. This post is about the new home for our girls. Prior to moving here, I had a dozen chickens. My boyfriend had 14. He re-homed 8 of his and I re-homed 6 of mine and so we blended an even dozen. No roosters! We live in the city limits. I had to get rid of my beloved Pumpkin who I had raised since he was days old. Now, try to imagine a corner city lot with an 1800 square foot home that is completely filled with stuff!!! The house had paths from the doors to the various rooms. Two of the three bedrooms were filled with stuff to the doorway with one of the rooms impenetrable. The outside was similar. There is an extra long driveway/patio that has debris completely filling it except for a parking area near the roadway. The backyard, and side yard were full of garbage and debris. 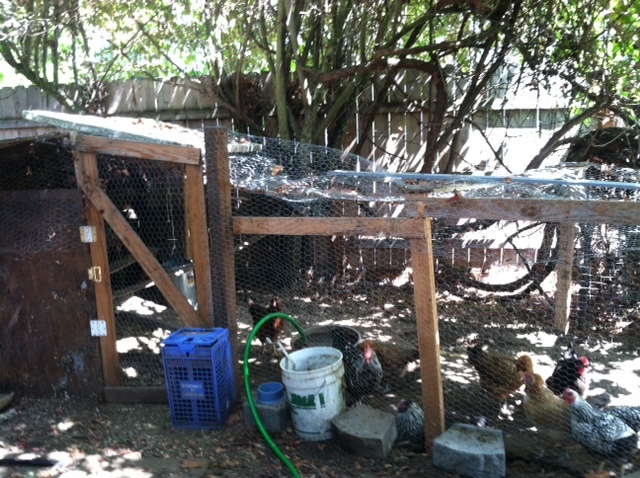 The makeshift coop in the back of the house under a bunch of overgrown trees and grape vines. Piles of garbage and debris on both sides! It’s only 4 feet tall. When my guy moved here and brought his chickens he built a makeshift coop/run. It worked. It wasn’t easy to access for cleaning. It was dark because it was in the over run jungle of a yard. The girls did not seem happy. I wasn’t happy about where they were. I wanted a place where I could hang out with them when I wanted to. After 3 months of working on getting the inside of the house livable, it was time to make a new spot for the girls. Laying the foundation for the coop…well…the first boards anyhow. The 8×8 box framed in for the coop. He can do it…he can build anything out of our pile of junk! We cleared out an area, shoving all the garbage and debris into a pile on the side yard. We will get it hauled away later. I will tell you more about debris and having things hauled away in another blog post. Now, my guy, he can throw anything together and make it work. So he starts piecing this 8ftx8ft square together. He calls me out and asks me to hold a couple of boards up while he screws them in place. I had no idea he was going to do this over Labor Day weekend until Sunday morning when he stated his intentions. So while he is sorting through the various piles looking for pieces of lumber, I start thinking about what I want in a coop. What do we have that can be used that we want to get out of the house? I am always looking for ways to get rid of things that are still in here. I remembered an entertainment center that I thought would work as a place for nesting boxes. I emptied it out (it actually had a few salvageable games like Trivia Pursuit and Monopoly in it) and cleaned it up and the guys hauled it out. A window so we can peek in to check on the girls without disturbing them. Dad showing son how to do it. He may not want to build things but he will know how!!! Love my gate by the way! The guys take a break. The walls up and the entertainment center (nesting boxes) installed! A real door on hinges! So nice for going in and out. Walls were put up. A window (I have a few from a 1902 house that I have moved with me two times now with hopes of building a greenhouse SOMEday) was installed. A light was found and installed. An old door was found and it too was installed so that we can actually walk into the coop to attend to the girls. That is a real nice change from the makeshift coop I’ve been entering all stooped over because it’s only 4 feet tall. I can go in and collect eggs fully upright! I like that. The girls have access to the coop and the run during the day with the pop door. Princess Diana, Thelma and Heavy Henrietta (she must weight 8lbs) enjoying their new hangout! What more could they want. A fenced area, a pop door and a white picket fence gate! It beautiful! Peggy and Goldie are checking out the coop. Let’s follow them and check it out ourselves! Time to move some more debris out of the way. We fenced in an area for a run. This isn’t being built with the intention of it being a permanent structure. It is just for the year or so we intend on being here. The guys didn’t bother to dig holes for posts, they just built the fence with scraps of lumber and added a little picket fence gate because I liked it and wanted an entrance to the yard for hanging with my girls. I asked for some roosting bars, a ramp for them to access the nests at the top of the entertainment center and of course the pop door for the girls to get out of the coop and into the run. They all figured out the ramp real quick. The LOVE going into the nesting boxes. I am peeking in through the window and look down to see a couple girls getting a drink! The waterer is automatic! They didn’t have much area for roosting in the other coop, but they sure figured it out quick tonight! The are trying to figure out who goes where. I had to take a couple of them out of the nests and put them on the roosts. Looking in through the window I can see the entire coop! 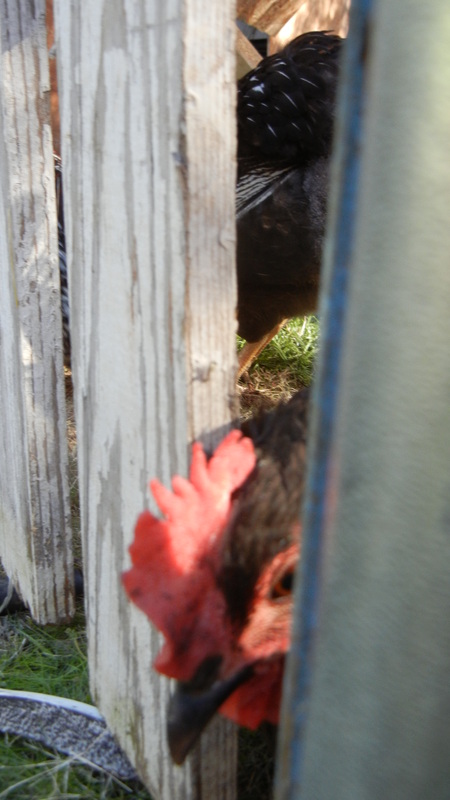 Our Golden Laced Wyandotte is peeking over the separation slat. Isn’t she pretty? There are plans of rigging up a pulley system for opening and closing the pop door, but we ran out of steam and time. The weekend is over and it was time to get some dinner ready and prepare for the work week and the young man of the house has school tomorrow! It is his senior year. I’m sure he would have rather spent this last weekend doing something else, but he helped his dad and learned how to build something useable out of what many would have considered junk. I am proud of them both and grateful for the wonderful new housing our chickens have. “Big” BLR Wyandotte showing “Baby” how to roost…kind of. These two love digging in the dirt in the corners. “Baby” BLR Wyandotte is about 10 weeks old. Baby is in front and Big is behind her eating some grapes. Oh, and we also have 2 new chickens that arrive last week. They are Blue Laced Red Wyandottes that were brought here from Utah on Monday. My boyfriend’s cousin raises them and we hope to become Wyandotte breeders eventually. So these cute girls (Baby Blue and Big Blue) are our beginnings! 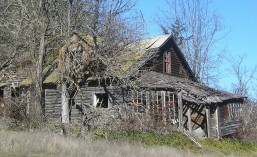 And this mess of a house that we are making into a home is my guys’ and my beginnings. I think we are doing pretty good so far! We are making a home for us, for the last kid living at home who is soon to fly the coop and for our feathered kids! It is going to be a heck of a year in what I had called “Hoarder’s Hell”, which is quickly becoming “Our Haven”.